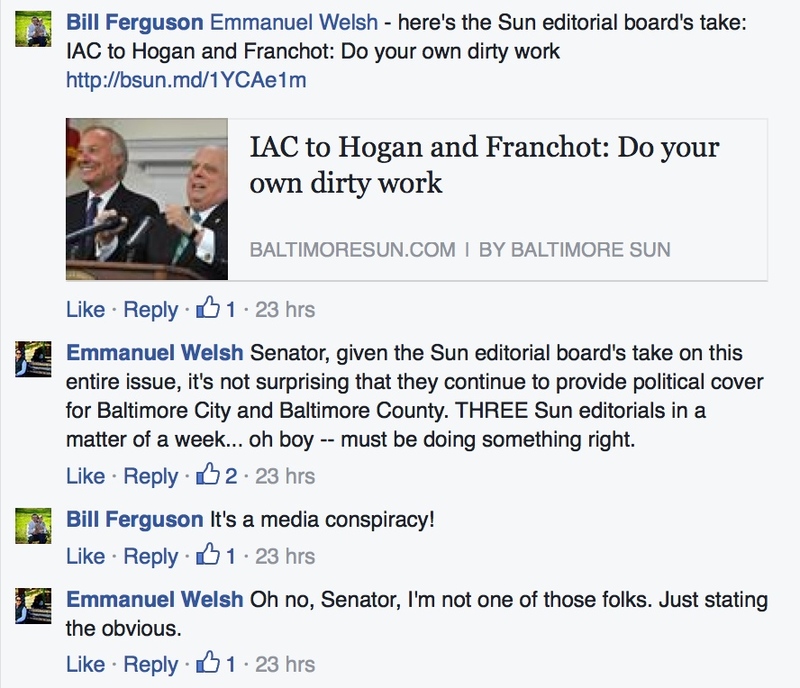 Governor Larry Hogan and Comptroller Peter Franchot have been grandstanding in fine fashion lately. They are both outraged that Baltimore County and City are not installing air conditioning fast enough throughout the school system. Hogan has more control over the budget than any other governor in the nation. He could have easily included the money for A/C in the budget without an iota of opposition but chose not to do so. Instead, he has set up a grandstanding moment with Franchot to deny the City and County monies needed for other school projects until they agree to install A/C in one year. They kindly dumped the decision of what other projects the City and County should forego for the A/C on the Maryland School Construction Committee (IAC). Normally, this Committee reviews local projects to make sure they are ready to go and comply with other complex state requirements. Local governments determine which projects are needed in line with the Republican principle of local control – something that has gone out the window here. 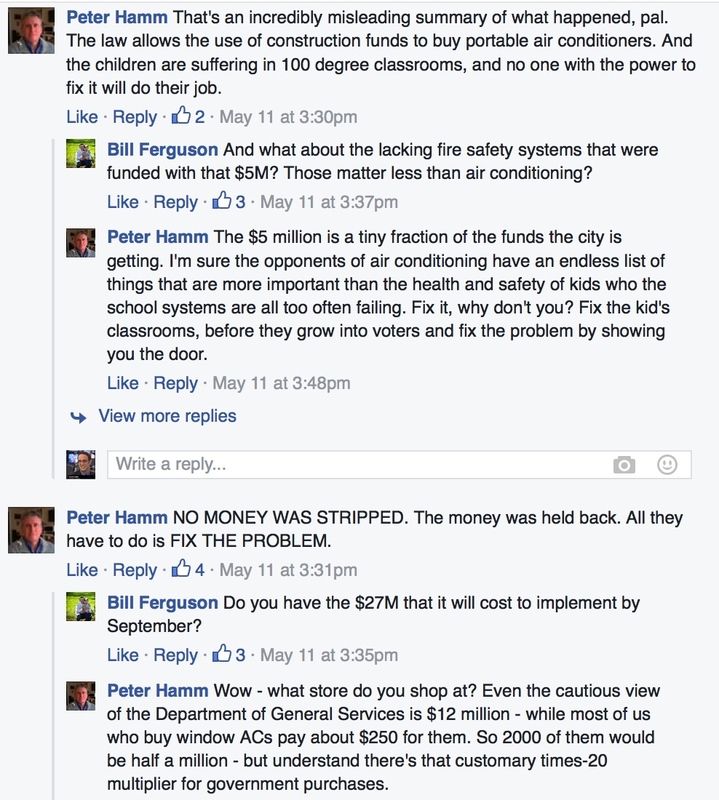 Former Sen. and IAC Member Barbara Hoffman is shrewd and nobody’s patsy. She said correctly that this wasn’t the Committee’s job and moved to pass the job back to Hogan and Franchot on the Board of Public Works, who are eager to take credit for A/C but don’t want to explain why they are nixing taking care of problems like unsafe drinking water, fire safety and collapsing roofs. Even Hogan’s representatives on the Board voted for Hoffman’s motion. Baltimore County Executive Kevin Kamenetz has gone one better and agreed to speed up the A/C but on the condition that the State reimburse the County for its share. 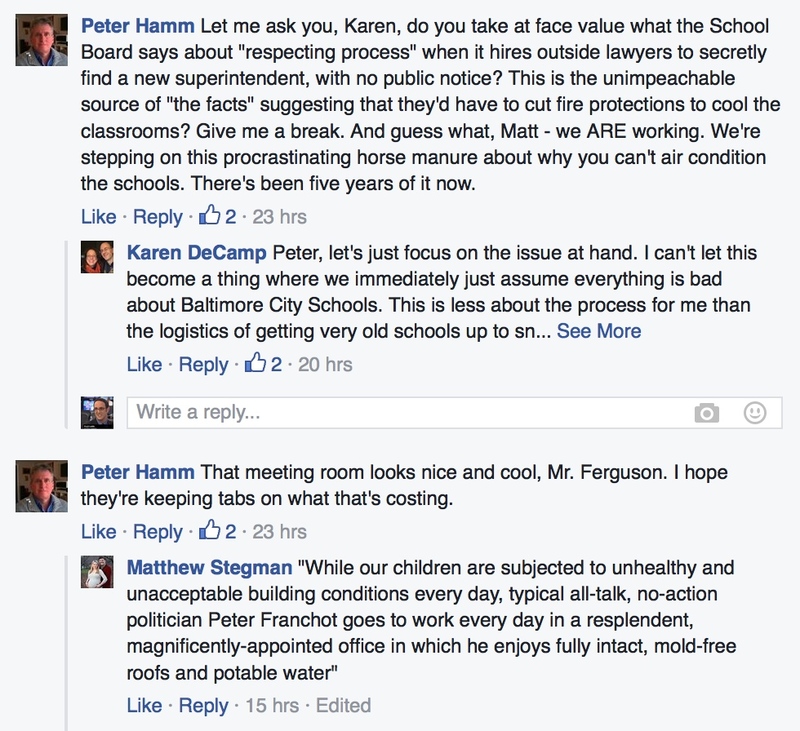 Will Hogan and Franchot put their money with their mouths and agree to Kamenetz’s plan? Or will they demand that the County install A/C but not fix other very serious problems important to student safety? 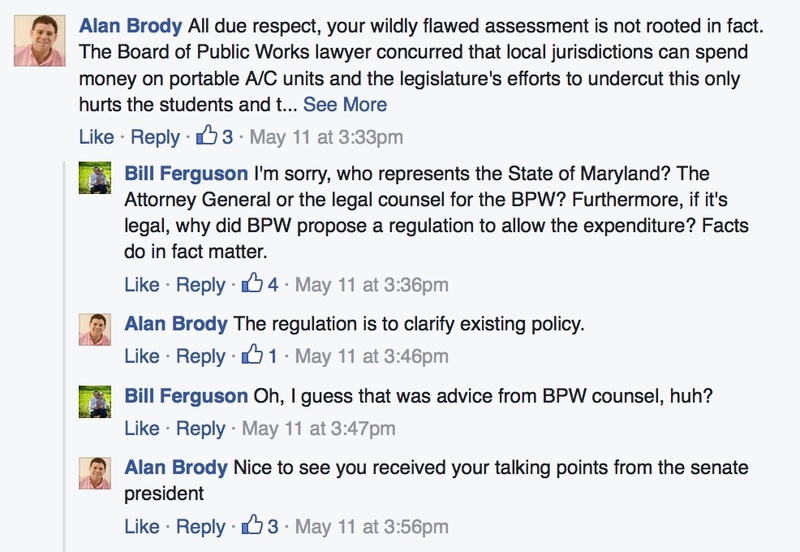 Meanwhile, Franchot’s staff seems to have little else to do but harry Sen. Bill Ferguson (D-Baltimore City) on Facebook for standing up for his jurisdiction’s priorities. Montgomery’s state legislative delegation doesn’t try to reorder our County’s priorities either. 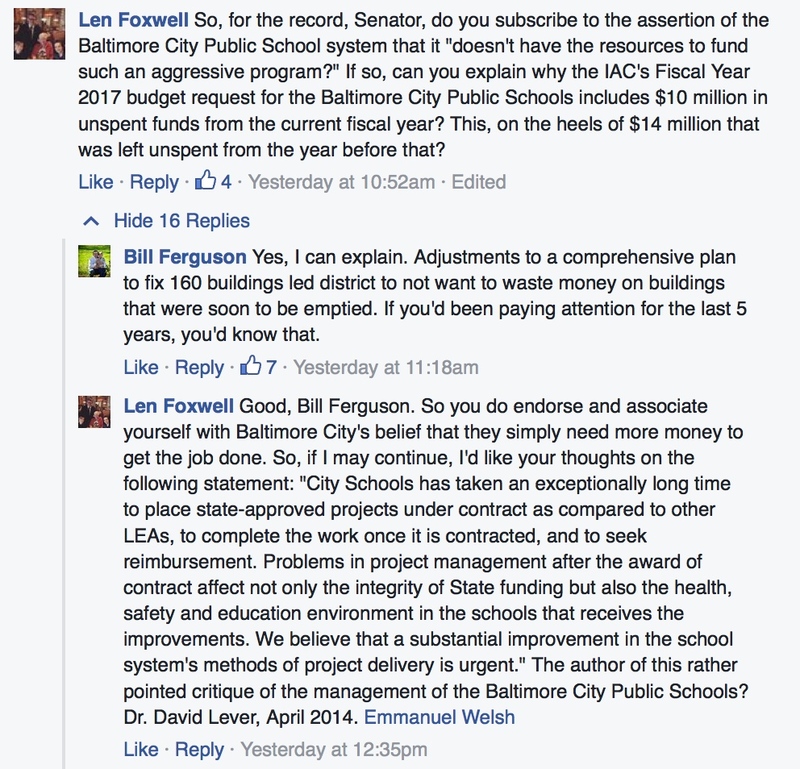 Communications Director Peter Hamm condescendingly calls Sen. Ferguson “pal” on Facebook. Proof, once again, that you may grow up but adolescence is forever. I never understand why politicians, let alone their staff, go after other politicians on Facebook pages besides their own. It rarely looks good. 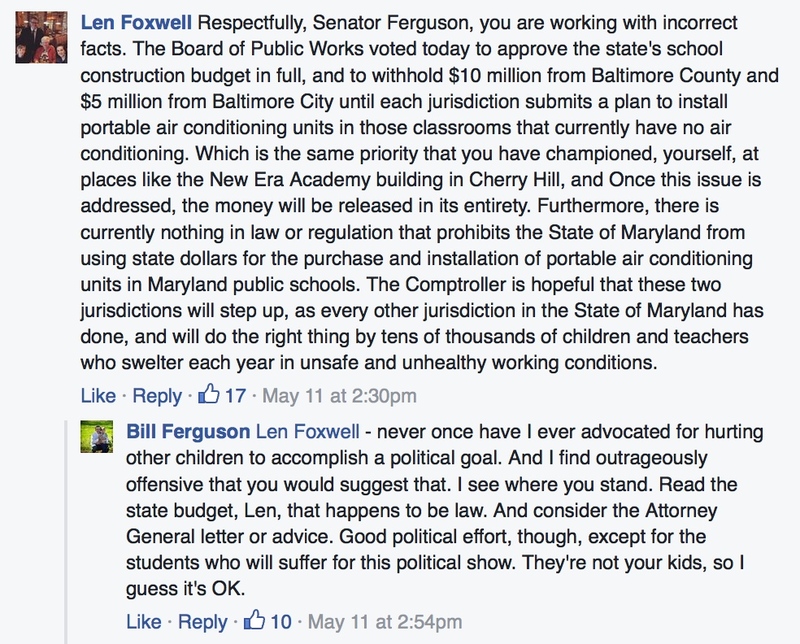 Sen. Bill Ferguson is running for reelection in District 46 (Baltimore). 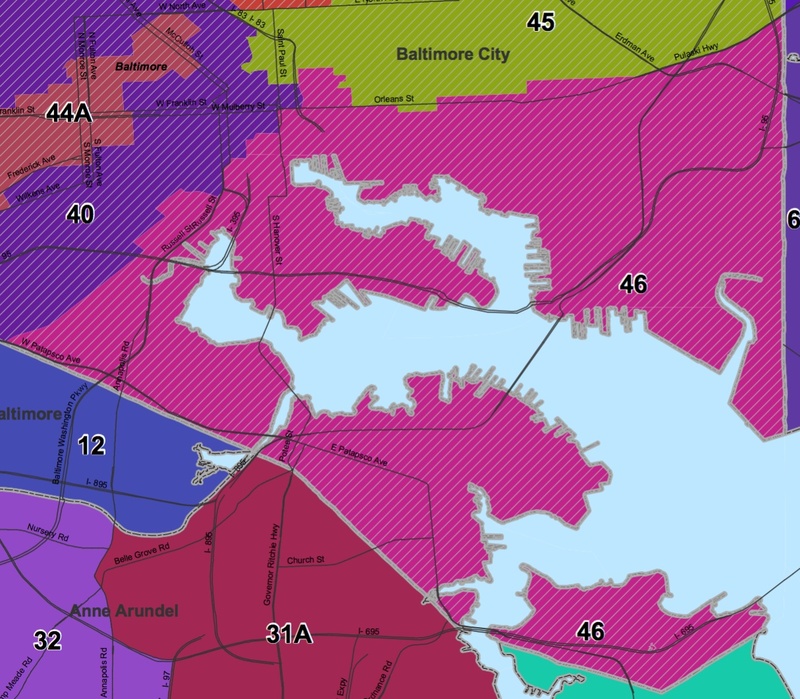 Compared to other Baltimore City districts, redistricting left District 46 unscathed and it still encompasses the neighborhoods surrounding the harbor. 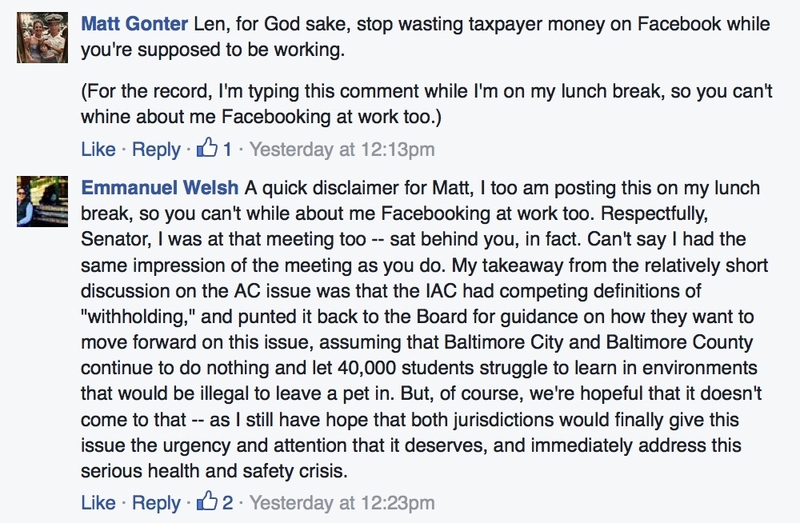 Like all of Baltimore City, District 46 is Democratic turf. No Republican has bothered to file for the legislature, so the Democratic primary is the election. Sen. Bill Ferguson demolished incumbent Sen. George Della with 59% of the vote in the 2010 Democratic primary. An impressive accomplishment, as Della had served since 1990 and is the son of a previous Senate President from the district with the same name. Coasting to his second term with only nominal opposition and $121K in his campaign account, Ferguson is just 30 years old. For these reasons alone, he has to be one to watch. The two incumbent delegates seeking reelection, Del. Luke Clippinger ($52K) and Del. Peter Hammen ($121K), should also be safe. Hammen is the senior member of the delegation, having served since 1994. He is also the most powerful, as he holds the Chair of the Health and Government Operations Committee. Clippinger is an assistant state’s attorney in Anne Arundel and unsurprisingly serves on the Judiciary Committee. He was a real leader in the fight for marriage equality. Attorney Brooke Lierman, who graduated from Walt Whitman HS in Montgomery County, is the favorite for the open seat for several reasons. First, she is the daughter of former Democratic Party Chair Terry Lierman (and sister of Kyle Lierman, who ran in D16 in 2010). Relatedly, she has $104K in her campaign account and the ability to raise more. My guess is also relatedly, Ferguson, Clippinger, and Hammen have formed a slate with her. Finally, it doesn’t hurt that she is reported to be very nice. Lierman is not a total lock for the seat. Bill Romani ran for delegate in 2010 and came in a respectable fourth. Romani has good name recognition and will probably raise enough money to run a respectable campaign–he now has $33K in the bank. But all that respect probably won’t be enough to overcome Lierman’s money and the slate, though expect him to do his best to surprise.